Let this Fitted Electric Heated Fleece Blanket-Queen Size show you there's nothing quite as pleasant as a toasty warm bed on a cold winter's night! 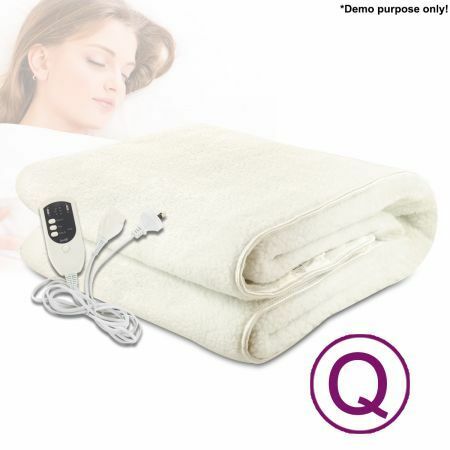 Now you can keep your bed lovely and warm with this electric blanket! With adjustable heat control and made from 100% polyester, this fleece blanket will keep you warm and snug whilst you are off in dream land. This fitted electric blanket will stay in place and features detachable control for blanket temperature while the safety overheat protection automatically turns off the blanket if it gets too hot. So say farewell to freezing winter nights and heat up your sleep with this Queen-sized electric blanket! Never sleep with the electric blanket /Electric Throw Rugs on,turned off when getting into bed. Do not wrap the electric blanket/Electric Throw Rugs around yourself. Do not use if wet.